Everyone should have at home a few essential oils on hand. Here is a small selection of oils to put in your first aid kit. All oils are wonderful, unique and special in their own way but these oils are very safe and very effective for everyday ailments perfect for your first aid kit. I have used all of these oils many times on myself, my clients, friends and family members and have been very impressed by the results. I have even been able to prevent going to the doctors with the use of just a few drops of oil. There are many amazing natural remedies but aromatherapy and essential oils appeals to many people with their amazing smells. Kids love essential oils and essential oils can even be used in certain cases for animals. There are multiple ways of using essential oils; each way offers different benefits. Inhale: Inhale directly from the bottle, diffuse with a diffuser or drop into your hands and take a breath. Ingesting: One drop directly on tongue or place essential oils into a clear vegetable capsule and swallow, or add a drop to liquids and drink. Skin: Drop the oil directly from the bottle onto skin or into hands and rub in. 1. Lavender: This fragrance brings about relaxation and a sense of calming to the physical and emotions. Pure lavender is generally regarded as safe for consumption by the food and drug administration. Often times lavender purchased from the store is not true lavender but a blended hybrid of genetically altered plants or synthetically created chemicals. It’s important to be sure you have a good source to get your lavender from. I use and recommend Young Living. *Lavender is a universal oil. 2. Lemon: Lemon oil fragrance influences freshness, feelings of health, vitality and warmth. This oil has powerful anti-infections, antibacterial, antiseptic, antiviral and overall disinfecting properties. Lemon oil promotes healthy white blood cell formation and improves the immune systems functions. Research shows that when vaporized into the air within 3 hours lemon oil can kill bacteria from the common cold, pneumonia, strep throat, diphtheria, typhoid fever and tuberculosis. Additionally lemon oil can improve memory and mental focus. 3. Peppermint: Powerful mental energizer. Excellent to help relieve tension headaches and is extremely beneficial for digestion, weight loss, sinus, gallbladder and liver disorders. Helps regulate body temperature and reduce fever. Additionally very helpful in relieving nausea and improves mental accuracy and focus. Congestion: rub 2 drops in palm and place over nose and sinuses. Breathe deeply. Can also be rubbed on back for deeper congestion of the lungs. Diarrhea/upset stomach: rub 5-9 drops over stomach. Can also take 2 drops in a vegetable capsule with water. 4. Purification: This oil is a great disinfectant and sanitizing blend. Made of oils of citronella, lemongrass, lavadin, rosemary, melaleuca alternafolia and myrtle. Purification completely neutralizes mold, mildew, cigarette smoke and unpleasant odors. Spray while traveling to neutralize unhealthy microbes that may be lingering in the air. 5. Thieves: This oil has been formulated based on research done during the “Black Plague” and has proven to have a 99.6% kill rate again almost every unhealthy microbe presented to it. Including airborne bacteria, virus, staph, strep and pneumonia. Comprised of clove, lemon, cinnamon bark, eucalyptus radiata and rosemary. There are many more amazing oils outside of these 5 that would add more tools to your all natural first aid kit. These 5 are a great start that will have you covered for many common ailments. 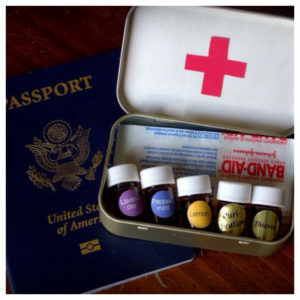 Stay tuned for more tips on putting together your all natural first aid kit. Young Living carries all 5 of these oils plus an additional 5 amazing oils in their Everyday Oils Collection. For more information Click Here.